Grill eggplants on a cast iron pan or mesh rack directly over stove until skin is blackened. Turn occasionally. Wrap eggplants with foil and let sit and cool about 10 min before peeling. Peel the skin by hand, then cut into strips. For dressing, finely chop garlic. Mix all dressing ingredients together. Heat oil in a pan and add chopped green onions. Sprinkle salt and coat. 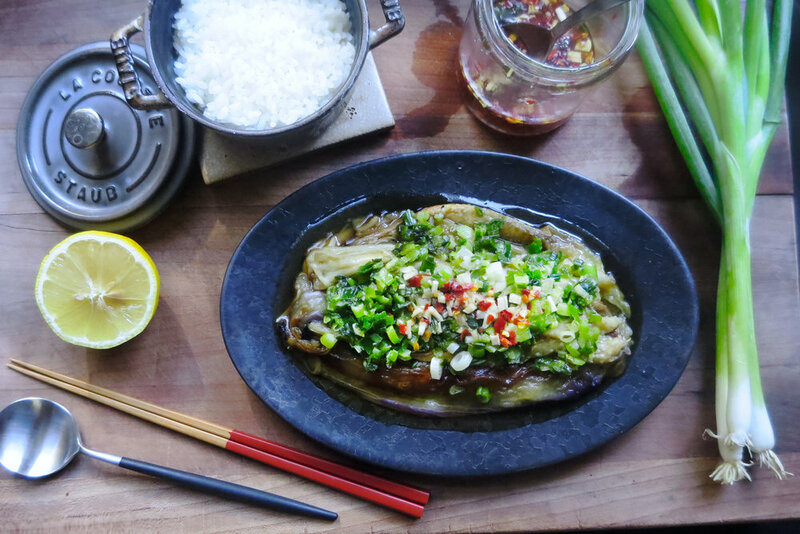 Top eggplants with green onions. Sprinkle pepper to taste. Pour over dressing. Serve hot or cold with rice. This Vietnamese style dressing can be used for pickling vegetables and condiment for noodles. Lasts 3-4 days refrigerated.